$500 DaySpring Shopping Spree Giveaway! Well, I opened my email to some fun news today! 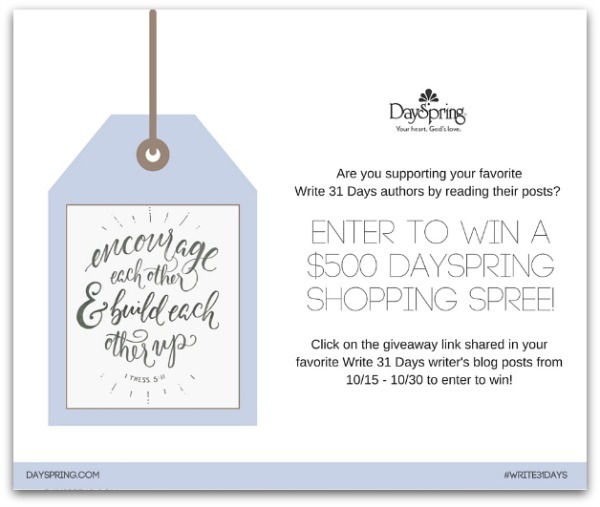 As part of the Write 31 Days challenge this October, DaySpring.com is giving readers a chance to win a $500 DaySpring shopping spree! If you’ve been reading along here, you will definitely want to enter to win this. DaySpring offers beautiful jewelry, journals, books and gifts for the home. A $500 shopping spree would go a long way toward someone’s Christmas shopping! Or birthday shopping. Or personal shopping. The giveaway is open from October 15 – October 31. To enter to win this $500 DaySpring shopping spree, follow the giveaway instructions found at the DaySpring link here. I’m rooting for one of you to win! We are people that crave independence. It’s so woven into our culture here in the States that we’ve named cities after it and built a nation on it. Our human nature is to grow toward independence. We can see it clearly in children. Kids start out absolutely dependent. Inside the womb, a baby is tethered for every bit of nutrition and oxygen she’ll need to grow. As a newborn, she can send a cry of alarm when she’s hungry but must rely on her parents to feed her. As a toddler, she may be able to reach her sippy cup, but even while demanding “I do it” she needs someone stronger to help pour her drink. She’ll eventually get tall enough and strong enough to pour her own glass of milk, but it’s her parents who stock the frig. Until finally one day, she’s launched – buying her own groceries, cooking her own meals and completely self-reliant. That’s how we grow physically. But spiritually, we’re to grow backwards. God calls us to give up our independence – our rights, our agenda, our control — to become dependent on Him. The goal for the Christ follower is to become less dependent on self and more dependent on God. More often, we give some control to God, but keep a lot for ourselves. Even as we open one hand to the Lord, the other holds tight to a part of our life we just can’t give up. Trials and suffering can put us in a place where we don’t have a choice. When we find ourselves in circumstances that are way too hard and situations that we cannot fix, we have no option but to depend on God. We may struggle against it, but God can use it to grow us backwards. When we are most weak, God is most powerful in us. In fact, Paul so knew the beauty of complete dependence on God that he went on to say he welcomed the hard places that drove him to depend on God. We’ve called this place helpless dependence. God has desired it all along — that we grow backward toward dependence on Him. The surprise is that resting in that dependence, instead of fighting against it, brings peace. It’s a peace that doesn’t make sense based on the circumstances, that’s for sure. It’s a peace that assures – even though your heart is broken, even though life has changed, even though the future is murky and unclear – God is here and God is in control and God WILL take care of us. I have tasted helpless dependence on God and I never want to be anywhere else. I know God’s promises and I know He promises dancing for mourning and beauty for ashes. I’ve begged God — when I get to the place where my heart isn’t as broken and the grief of my children isn’t as pressing and I can breathe a relieved sigh, do not let me move from You. I have seen more of Him, heard more from Him, trusted Him with more than any other time and I don’t want to go back even when we’re better. In my weakness, God has been strong. Today, let’s choose dependence. Let’s REST in the good hand of our loving God Who’s got this. God is strong in our utter weakness and He delights in our dependence on Him. P.S. For more encouragement in your inbox, you can subscribe to new posts here. And I’d love to see you in our Facebook community here. This is part of the 31 Days: Braving the Broken series. You can find all of the posts here or subscribe for updates. I often wonder how much of God I miss. I burrow my head down to get through my agenda and focus on the urgent in front of me. Even when I do catch glimpses of God’s hand in my day, I can miss connecting all the dots around it. A few years ago, I began keeping a list of things I could thank God for. I needed to see the good in our days. I was full up with pressing need and a shapeless future and I needed to record all the good right in the midst of the hard. 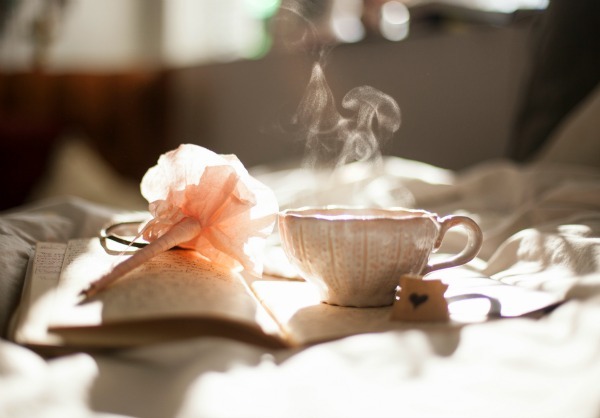 Each morning, I opened my journal, numbered a short list and began to think back over the previous day. What had the day held? How had God revealed Himself? What special things had made me smile? I kept a running list. Some mornings, I listed really big things. Most times though, I thanked God for small moments, little things, everyday comforts that were like a personal present wrapped just for me. When I start with thanking God, it keeps me from rushing straight to my long list of needs. My instinct is to start with my need because I so want God to fix it. 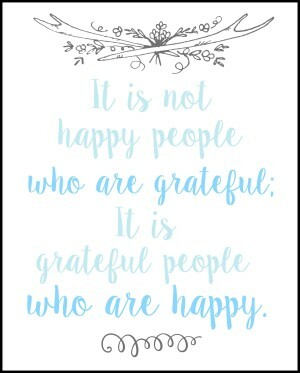 But starting with thanksgiving first flips my perspective around. Instead of hyper-focusing on my circumstance, I begin to see all the ways that God has already loved me. I see God’s goodness, how He’s gone before me, His provision, His sufficiency and really? How richly blessed I am. I begin to connect dots between my prayers and what God is doing. 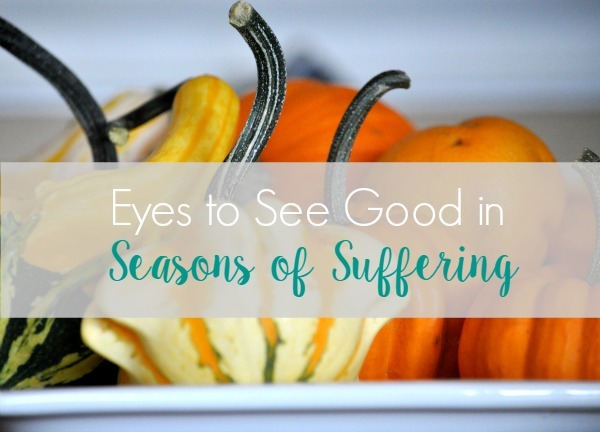 Having eyes to see good in seasons of suffering changes my whole perspective. 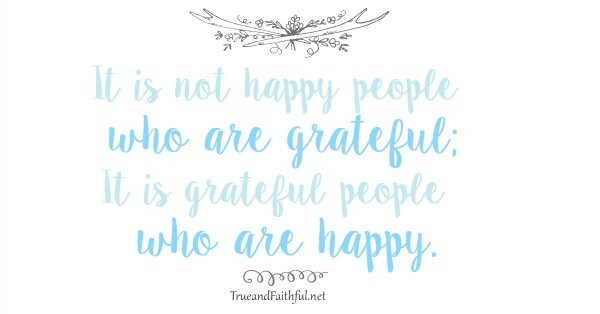 I called a friend yesterday who I knew also kept a thankfulness journal. I asked her why she had started. Debbie and her husband had been heartbroken over a difficult situation. “We were blaming ourselves for what happened, saying this must be something we did and deserved.” But then Debbie read Ann Voskamp’s book One Thousand Gifts and she began keeping a list of thanks. 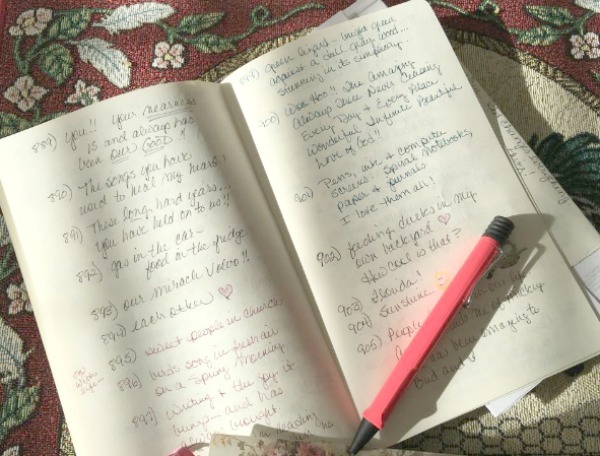 Every day, she would add to the list, keeping her journal open and recording her thanksgiving throughout the day. Writing down my thanks helps me see not just that God is good, but that He is good to me. Debbie said her habit of writing down thanks prepared her for a season of back-to-back hard. First, she was diagnosed with a bone tumor that was benign but still meant surgery and a long recovery. Six months later, her husband was badly injured in a car accident, requiring more surgery and more recovery. Nine months after that, Debbie found a lump and went through aggressive cancer treatment. Writing down my thanks helps me capture God’s goodness not just for today, but for tomorrow when I need to remember. God asks us to give thanks in all circumstances. Not thanks for the suffering, but thanks in the suffering. I don’t want to miss it. Right in the midst of even the hard days, I want eyes that see God’s goodness. 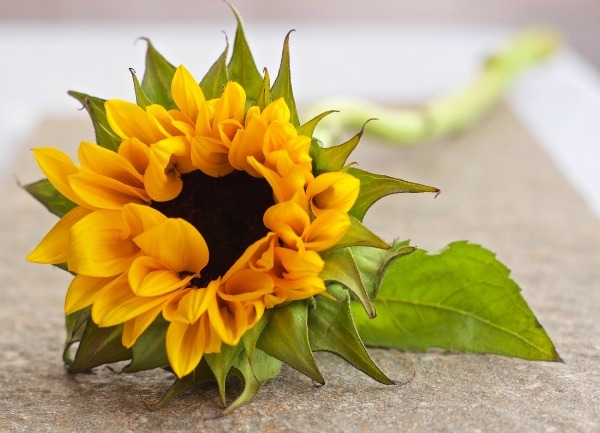 This is Day 9 of 31 Days: Braving the Broken. I’d love to have you join us for this series by subscribing here and join us on Facebook here for even more encouragement.